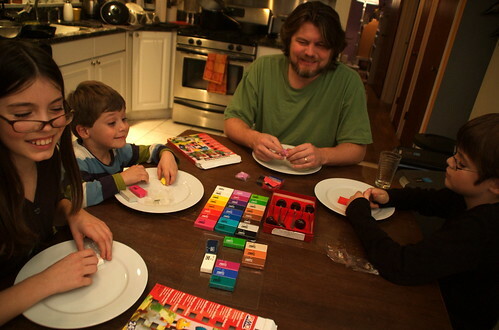 Wednesday night after dinner we broke out the Fimo clay. I have a love-hate relationship with the stuff because you have to knead it for a good long while before it becomes really workable, but the colors are great and it holds up well after cooking. We’ve used Sculpey in the past to make Pokemon characters, and I think that’s better for younger kids because they can just get to work creating. I was so impressed with the effort the kids put into it. Tor whined for a while, but after everyone else was done, he went back to the table and made several very cool worms. Maggie made these awesome chickens to add to our Creche (wich I’ll have to post about after we bring it out of storage for the Holidays). Bjørn made another pokemon — naturally. And Tomas made a family of purple aliens. Me? I made a little Christmas tree & then set to doing the dinner dishes. 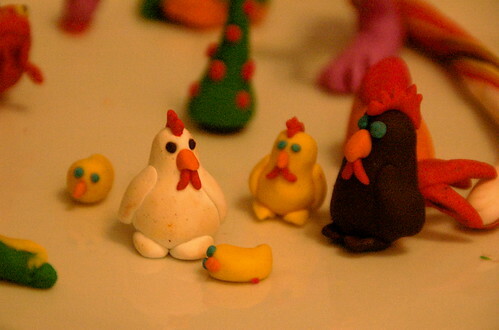 I was looking for easy FIMO birdies to make for my first post on my first craft blog when I came across this post. Heck, those kiddos are talented!